Being a bad girl and going fashion is not incompatible and we present the protagonist of the next game that is a clear example of it. This girl is a hired killer but she likes to be well dressed so as not to attract too much attention. We will have to choose a nice look for his next mission and we can not forget to add a weapon to kill his target. You have many clothes to choose from to make a great outfit and go to the latest fashion. Prepare the girl for her mission, forget to put some accessories and shoes to finish. Sunglasses can be paramount since we do not want anyone to recognize them once their mission is finished. Make as many combinations as you want and you saw the girl to kill. 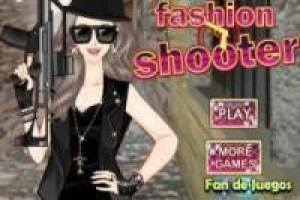 Enjoy the game Fashion shooter, it's free, it's one of our dress games we've selected.